From bad-boy chef to world-traveling CNN reporter, Anthony Bourdain led a wild life. He was a relatively unknown executive chef in New York until becoming a best-selling author at 44, a television host at 46, and a father at 51. Tragically, the chef-turned-travel-show-host died ten years later while visiting France for his Emmy-winning show, Parts Unknown. 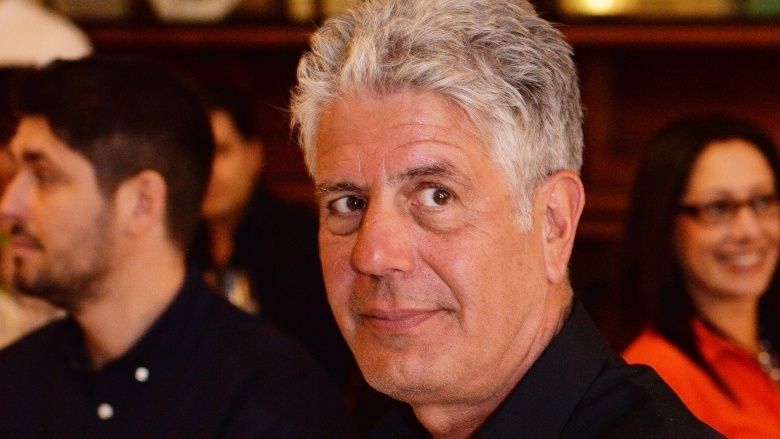 On June 8, 2018, Bourdain was found unresponsive in his hotel room by his longtime friend and fellow chef Eric Ripert. His death was ruled a suicide. Throughout his life, Bourdain was a controversial figure who never seemed totally comfortable with the fame that accompanied his rapid rise to stardom. As a result, he led somewhat of a conflicted life; having been known to both praise and decry celebrity chefs; slamming parenthood then having a child of his own; and even adapting a healthier lifestyle while outwardly promoting what appeared to be the exact opposite on his shows. Let's take a look back at the double life of Anthony Bourdain. 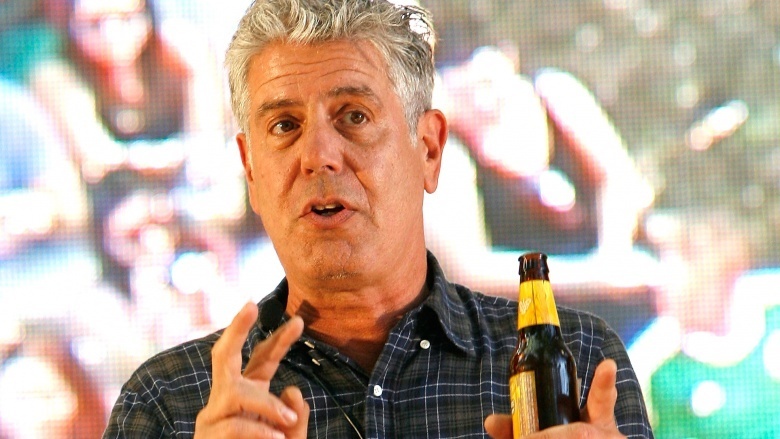 Bourdain adapted a cleaner, healthier lifestyle in his later years, but for most of his adult life, he was an unashamed and unrepentant smoker and drinker. In his 2000 tell-all memoir Kitchen Confidential: Adventures in the Culinary Underbelly, Bourdain explicitly wrote about his prior drug use, including a major heroin addiction picked up in the kitchens of 1970s New York. "Hardly a decision was made without drugs," he wrote. "Cannabis, methaqualone, cocaine, LSD, psilocybin mushrooms soaked in honey and used to sweeten tea, secobarbital, tuinal, amphetamine, codeine and, increasingly, heroin, which we'd send a Spanish-speaking busboy over to Alphabet City to get." Bourdain considers himself lucky to have kicked heroin in the 1980s; he knows many people who weren't so fortunate. In addition to getting clean, Bourdain is no longer the drinker he used to be, and he quit smoking in 2007 after the birth of his daughter. Bourdain was known for speaking harshly about other famous chefs, but he could talk out of both sides of his mouth when it behooved him. Bourdain publicly issued scathing smackdowns of Paula Deen, Rachael Ray, Guy Fieri, Bobby Flay, and even kitchen sweetheart Emeril Lagasse. 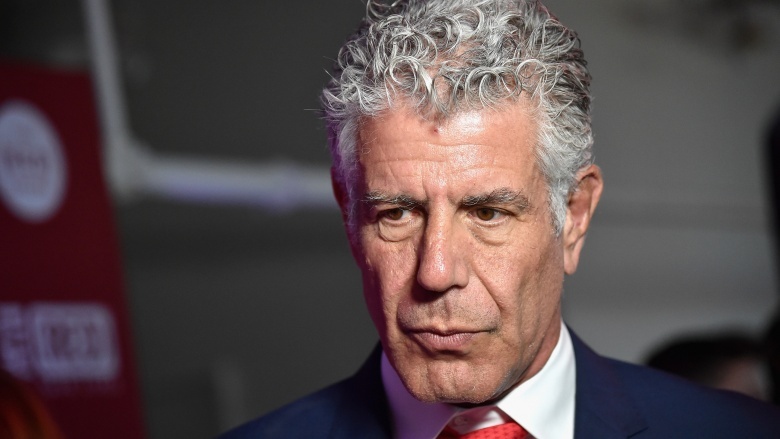 Bourdain called Deen the "worst, most dangerous person to America," telling TV Guide she "revels in unholy connections with evil corporations and she's proud of the fact that her food is f**king bad for you." He oozed disgust over the whole scene surrounding culinary stardom, which is ironic because his fame was embedded in that world. Bourdain stuck to his principles on some fronts, such as the kind of merchandising deals that made his peers rich, but he softened his stance on other topics. In an Ask Men interview, he had some less than terrible things to say about Lagasse. 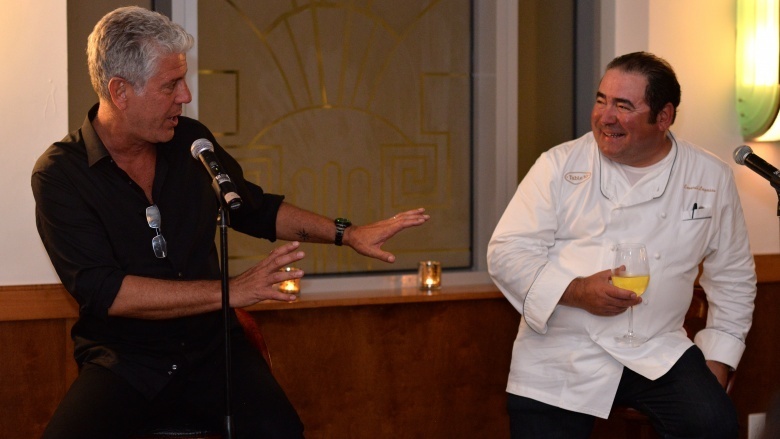 "He runs a really impressive quality empire of restaurants," Bourdain said. "I mean, his show is unbearable but he looks absolutely lovable … so awkward and sloppy and unattractive … I don't slag the guy anymore." 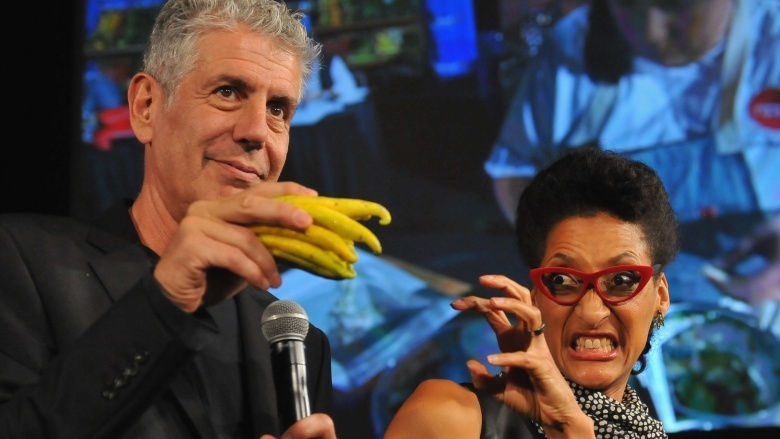 Perhaps Bourdain eased up on his peers because he endured some serious slagging for succumbing to the mainstream food competition craze by appearing on ABC's The Taste. A Grantland writer said Bourdain's involvement proved he'd been "defanged like an aging circus lion," and an A.V. Club story claimed the show "shredded any future credibility when he calls a TV chef a sellout." Bourdain also dished out some very harsh criticism of vegetarians, comparing them to terrorists. In a 1999 piece for The New Yorker, Bourdain wrote, "Serious cooks regard these members of the dining public — and their Hezbollah-like splinter faction, the vegans — as enemies of everything that's good and decent in the human spirit. To live life without veal or chicken stock, fish cheeks, sausages, cheese, or organ meats is treasonous." Time (and age) significantly softened that view. In 2010, he told Mother Jones, "I admire vegetarians who refuse to eat nothing but vegetables in their homes, but I also admire those who put aside those principles or those preferences when they travel. Just to be a good guest." 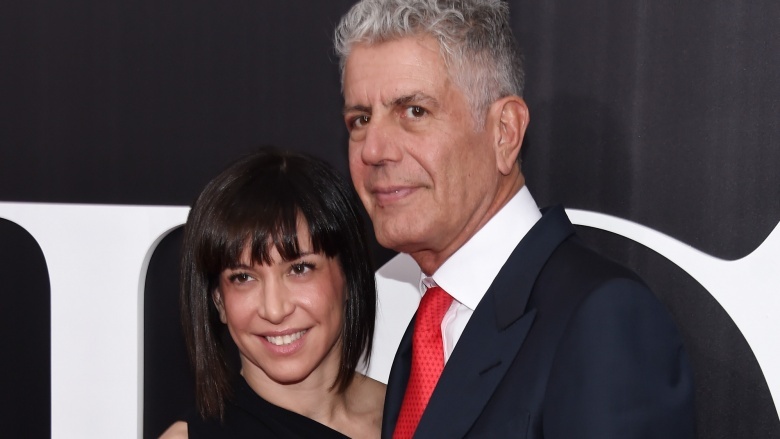 Bourdain's ex-wife, Ottavia Busia, is a Brazilian jujitsu mixed-martial-arts specialist, whose passion for the sport got Bourdain hooked on it later in life. He even competed and earned a blue belt in 2016. That's impressive, particularly since it flies in the face of Bourdain's earlier days when he indulged in far less disciplined and far more unhealthy pursuits. In an interview with Mother Jones, he admitted to smoking three packs of cigarettes a day until his daughter was born. 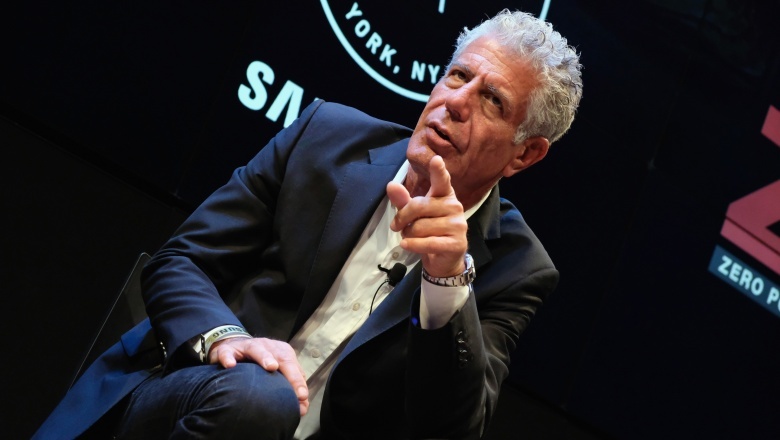 Even after ditching the habit, Bourdain brushed off the accomplishment. "I haven't seen my life improve in any tangible way at all since I quit," he quipped. In the same interview, Bourdain simultaneously equated eating McDonald's with "huffing crack in front of your kid," but admitted that he loves "the macaroni and cheese at Popeye's" and even the fast food fare "at the Colonel." Bourdain had a way with words, both the poetic and the profane. As he admitted in an interview with the Daily Mail, "I had a reputation for being cynical and foul-mouthed and a bit of a p***k." He's been equally blunt about ditching his edgier life when his first child, daughter Ariane, debuted in 2007. "The second she was born, the Ramones T-shirts, vestigial leather jackets, that s**t was in the garbage. It's gone," he said. "It's undignified at my age." Bourdain married twice — the first time to high-school sweetheart Nancy Putkoski from the '80s to the early 2000s. He cited the transformation that come with traveling the world as the main cause of their breakup. "She was the love of my life," he told The Guardian. "But everything changed." Bourdain said he didn't regret waiting to become a dad. "I would have been a s**t parent," he said. "I'm a very good uncle. The evil uncle who lets them do everything. But a parent? Up until very recently I could hardly take care of myself." Bourdain's feelings about family life made an about-face in 2007 after marrying Busia and having Ariane. The fiercely independent workaholic reportedly made serious adjustments to his shooting schedule to have more time with his family. "I can't be away that long, because I come back and my daughter is different," he told Fast Company. "I'm trying to be a good dad, given the weirdness of my situation. Nothing makes me happier than watching cartoons with my daughter." By September 2016, Bourdain and Busia had divorced, after which Bourdain revealed to People that they'd lived "very separate lives for years." He also confirmed that he was traveling "about 250 days a year," and his daughter had "gotten used to it," describing her as "a very healthy, very happy, self-assured little girl who knows she's loved, who finds her parents entertaining." Bourdain seemed like a wildly successful, brash, know-it-all adventurer, but this famous foodie wasn't born with a silver spoon. In fact, Bourdain didn't achieve financial stability until his memoir, Kitchen Confidential, found its audience. As he told Biography, "At the age of 44, I was standing in kitchens, not knowing what it was like to go to sleep without being in mortal terror. I was in horrible, endless, irrevocable debt. I had no health insurance. I didn't pay my taxes. I couldn't pay my rent. It was a nightmare…"
Bourdain's big break began in 1999 with a one-time writing gig for The New Yorker titled "Don't Eat Before Reading This." That transformed into a book deal (Kitchen Confidential), which turned into a show on the Food Network called A Cook's Tour. A year later, No Reservations launched on the Travel Channel in 2005. As the contract for No Reservations expired in 2012, CNN asked Bourdain to lead an original series. He served up Anthony Bourdain: Parts Unknown, which won several Emmy Awards and a prestigious Peabody Award. 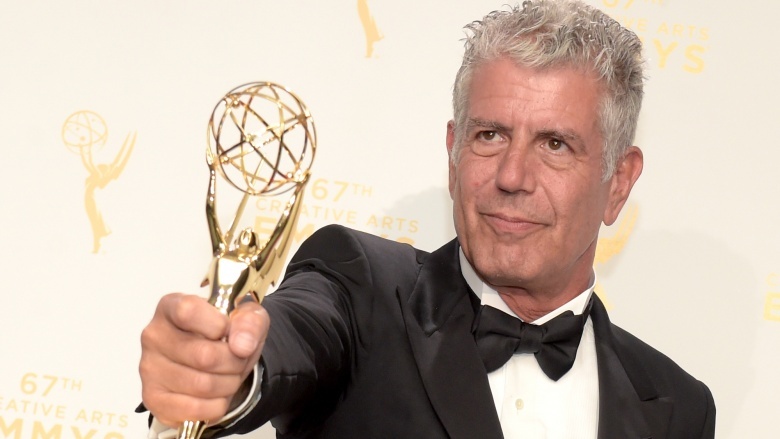 Though Bourdain's life ended tragically, he clearly took some pleasure in his unconventional approach to his late-blooming fame, and he earned the accolades to justify it. If you or someone you know is having suicidal thoughts, please call the National Suicide Prevention Lifeline at 1-800-273-TALK (8255).